Don’t treat this toddler with kid gloves. He means business. 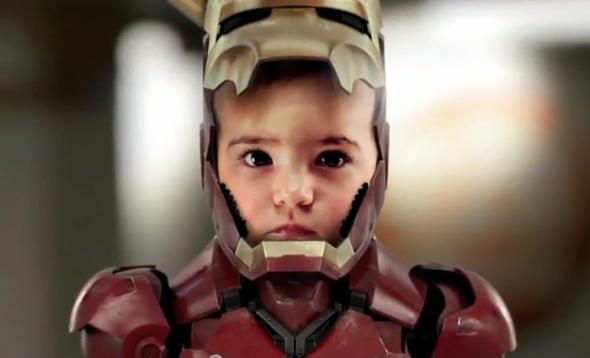 Tony Stark goes four quadrant: here’s his origin story going as far back as when he was a toddler. It could be a place to take the franchise if Marvel runs out of ideas for its genius super hero and wants to broaden his demographic. It’s a way to keep the franchise fresh while recasting Tony Stark as a less jaded, more sympathetic version of himself and broaden Iron Man’s demographic to include families that ordinarily attend Pixar movies. But then Disney will have two of its brands competing with each other. Oh, well. They’ll hammer it out in the board room. Champagne problems.